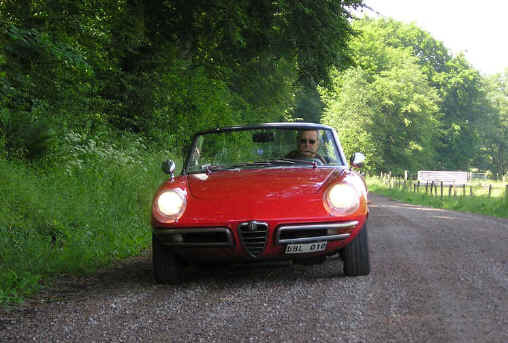 Welcome to have a look at my Alfa Romeo Spider Veloce 1967. I'm from Sweden and have been Alfista since 1960. Today I am on my 19th Alfa Romeo and still as thrilled as the first time. Remember the "Sounds of silence" and "Mrs. Robinson" by Simon and Garfunkel? That music is excellent Spider Veloce music since Dustin Hoffman was driving his Duetto in the movie "The Graduate" in 1967. If you haven't seen the movie yet, just go get it and enjoy the Alfa Romeo Spider. That's my car. The word "Spider", like so many coach-building terms, comes from the days of horse-drawn vehicles, when a Spider was a light two- or four-wheel carriage, with no entomological associations. It was an English or possibly American term which found its automotive application in Europe, especially in Italy. The actor James Dean was killed in an accident driving a Porsche 550 Spider but the legend sometimes blame the Porsche 356 Speeder or simetimes Spyder. Some Italians say the word comes from "speed", which becomes "speeder" or "Spider". The facts are, that it is Spider and not Spyder because of an official statement by National Federation of Body makers in 1924 in Milan (Italy), that declared the word to be written that way. The "y" was not in the Italian alphabet since it was a fascist and nationalist period. It's, as you know, the equivalent for "roadster", "speedster" or "two-seater". Spyder comes from a kind of horse-cab manufactured by Holmes in Dublin (Ireland), developing an idea born in GB in 1860 as a mix of the Tilbury-type cab (two seats, two wheels) with the phaeton (four seats). Holmes named his cabs "Spyders", as they resembled "Spiders" for their large and light wheels and the body (very light) suspended among them. The Spyder had two "main" seats (with a "cabriolet" cover)+ 2 "emergency" seats on the rear, for the "valets". So, when that decision was taken in 1924, they thought to oppose to "Anglicanism" but, as a matter of fact, they "corrected" Mr. Holmes! Alfa Romeo Duetto Spiders, lined up in Ligurioa, Italy. My Alfa Romeo is probably the oldest Spider Veloce still running and I have not yet located any Spider Veloce with a chassis number lower than mine. My car has "autoleaio" 119 which Luigi Fusi ranks as a 1967 in his excellent book Alfa Romeo Bible. The car is red of course, Rosso Farina. This color has a slight tone of orange, which makes the red color a bit light. Very attractive, indeed. In the '60s, the 501 was very popular on Alfas. This color is however a bit more red than the Rosso Farina. In the Picture Gallery you may have a look at the different cars. If you send me a photo of your Alfa, I'll add it to my gallery. Share my mechanical tips highlights and mistakes, of course. Lots of photos here. If you have a Spider Veloce or a Duetto, please register model, year and chassis number, graze. This will give you full access to my Spider register and the opportunity to contact the owners yourself. I am trying to locate the remaining Spiders from the good years, when cars were cars with carburetors, Buddy Holly and Jerry Lee Lewis were the artists and girls were girls! Know what I mean? How about that, wish you had one, eh?